A division of Thermaltake Gaming, Tt eSPORTS is committed to bringing the most personalized and the highest quality gear for the most competitive cyber battles and advances the idea of products designed by gamers for gamers. Tt eSPORTS has continually been a major driving force in inspiring, challenging, and taking to new heights eSports in the professional gaming industry; and currently sponsors a multitude of gaming teams and streamers from around the world by equipping them with the necessary gaming gears – keyboards, headsets, mice and accessories – to compete and succeed at the highest level at major eSport events such as: Dreamhack, Insomnia, epic.LAN and the Intel Extreme Masters. Tt eSPORTS continually strives to promote eSports as a global phenomenon and to put it onto the world stage. 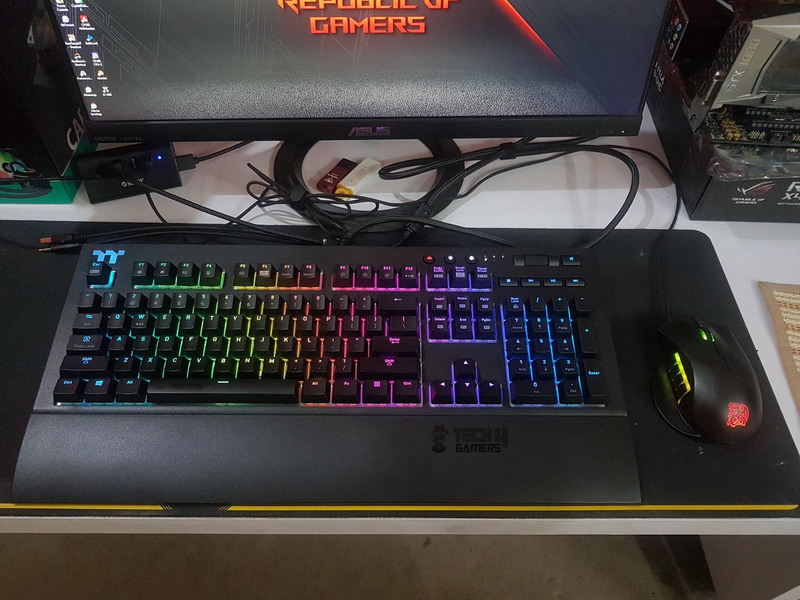 Thermaltake under the branding TT Gaming has launched multiple peripherals which are their premium grade products aimed at the enthusiasts. Today, I will be taking a look at their premium mechanical gaming keyboard named as TT Premium X1 RGB Cherry MX Blue Keyboard. 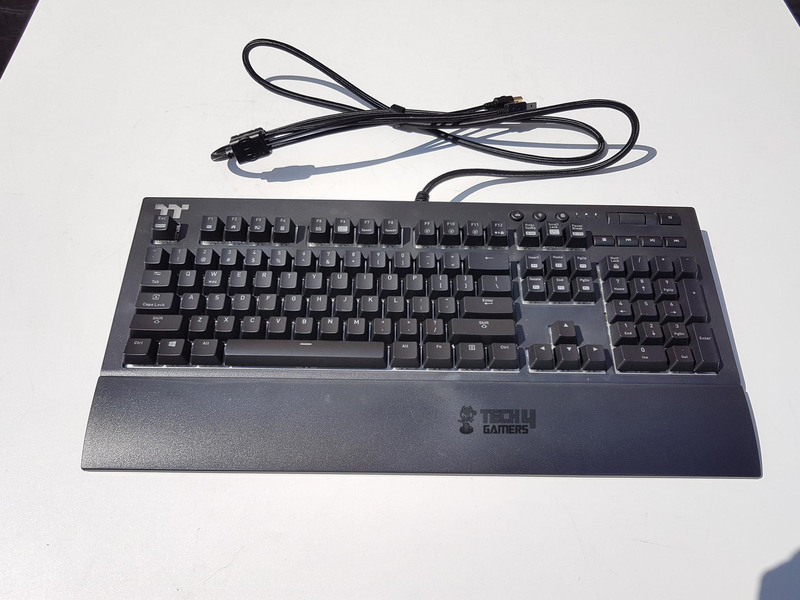 This keyboard is features rich and Thermaltake has enabled the mobile App support in addition to the regular PC desktop software. We have brilliant and vivid 16.8M true RGB color illumination using 12 dynamic lighting effects. There is a TT premium logo on the top left side which illuminates as well and really stands this keyboard out. Speaking of the core functionality, this keyboard features blue switches from Cherry MX and I am absolutely loving the clicky sound on these switches though I can’t say the same about other people around me when I am using this keyboard. Pun intended! 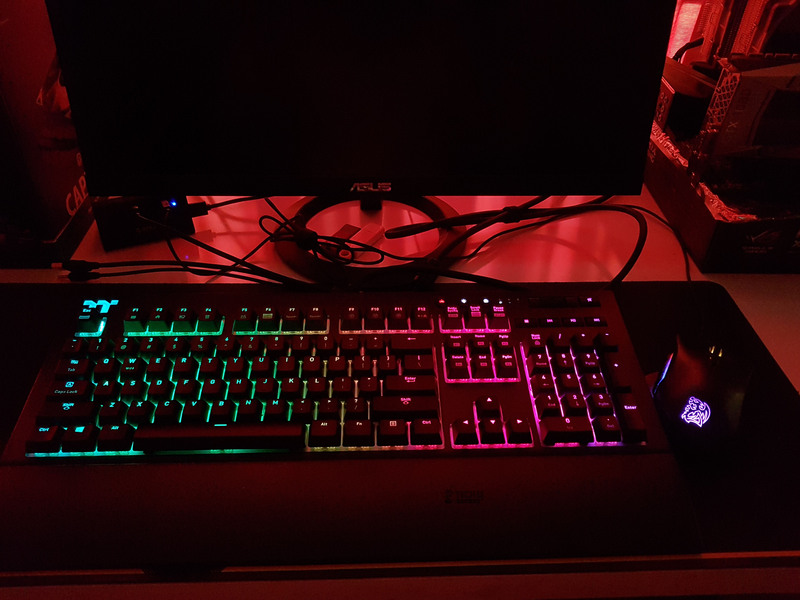 This keyboard fits in the TT ecosystem as the lighting effect can be synced and coordinated with the other Thermaltake RGB products like RGB/iRGB PSUs, RGB peripherals, fans etc as long as all those products have TT RGB Sync Logo. The X1 RGB uses CHERRY MX switches with built-in gold-crosspoint contacts, gold-plated contact closures, and pressure-resistant metal alloy springs for the most precise, accurate and feel for every touch. The switches also come rated with a 50-million keystroke lifespan for utmost durability. The X1 RGB Blue switch provides a crystal clear click pressure point highlighted by an audible click for tactile and precise key operations. The users also have voice command option to interact with the keyboard which is a cool feature to have. Let’s dive in and see all the bells and whistles on this keyboards. The keyboard is shipped inside a black color cardboard box. The top side of the outer packing has Thermaltake’s premium logo and brand name printed on the top left. 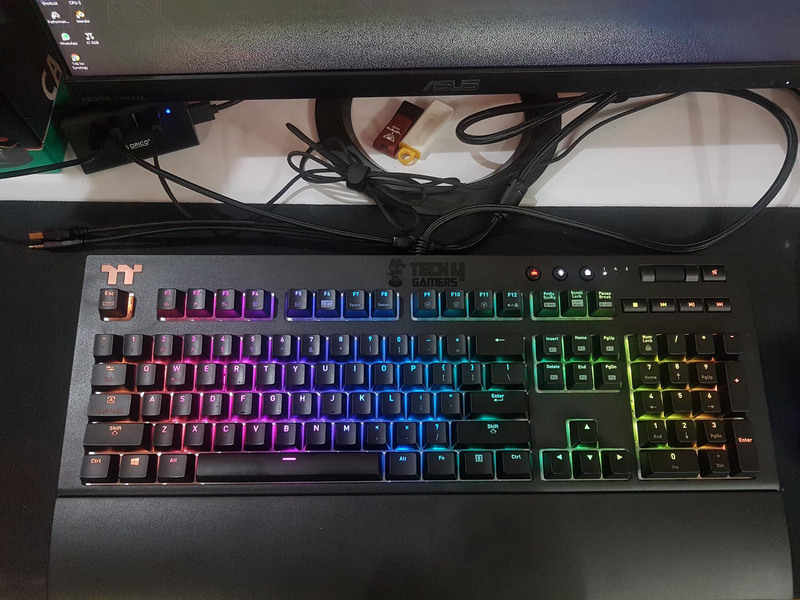 X1 RGB Mechanical Gaming Keyboard text is printed at the bottom left side. A picture of the keyboard with RGB colors illumination is printed on the main text. Salient features of the keyboard are printed on the left side of the picture. The backside of the outer packing has Thermaltake’s premium brand logo and name printed on the top left. There is a labeled picture of the keyboard printed on the main section towards the left side. The labels are printed on the top of the picture. The system requirements and contents of the box are printed at the bottom side. 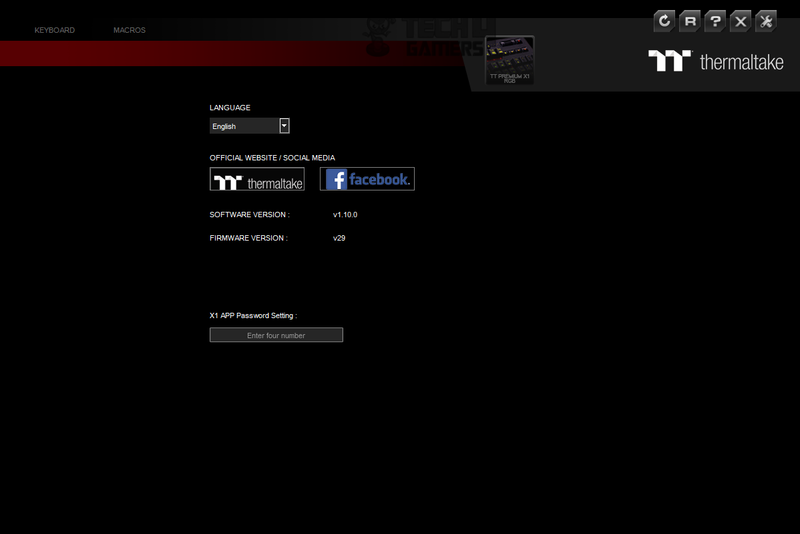 The built-in color gaming profiles are mentioned on the top right side. USB and audio jack pass-through ports along with the volume rocker and multimedia keys are mentioned on the right side. 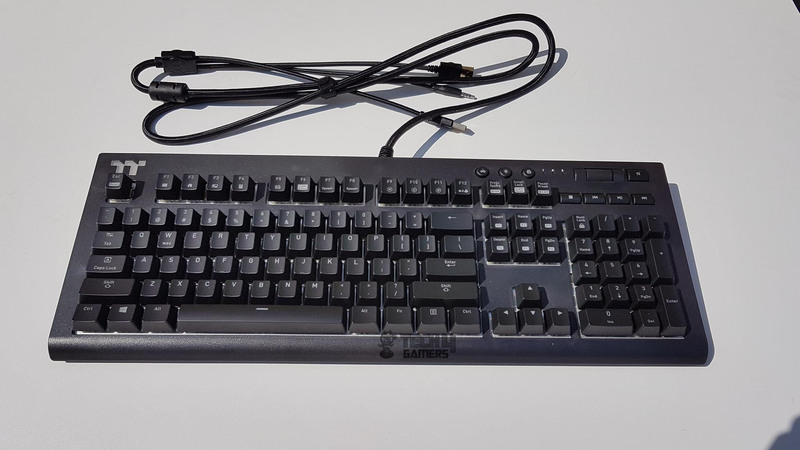 This side has the text “Professional Gaming Keyboard” printed in 16 languages. The technical specifications are printed at the bottom. A serial no sticker is pasted on the rightmost side. This side has a plain black color. The Thermaltake’s premium brand logo and brand name are printed in the center. The left and the right sides are identical in layout. The Thermaltake’s premium brand logo and brand name are printed on the left side. X1 RGB Mechanical Gaming Keyboard text is printed after the brand name. There is a colorful picture of the keyboard printed on the right side. 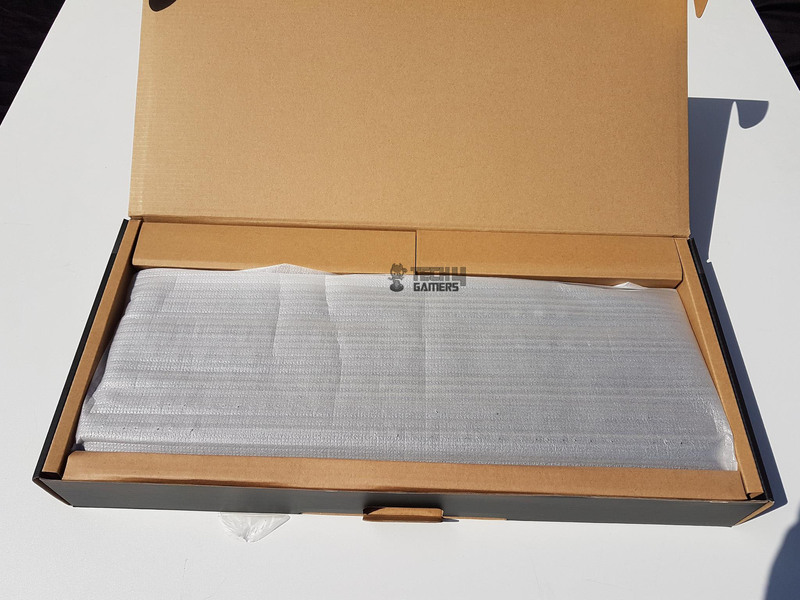 Opening the box will show the concealed contents of the box. The keyboard is wrapped inside white color, non-transparent protective sheet. 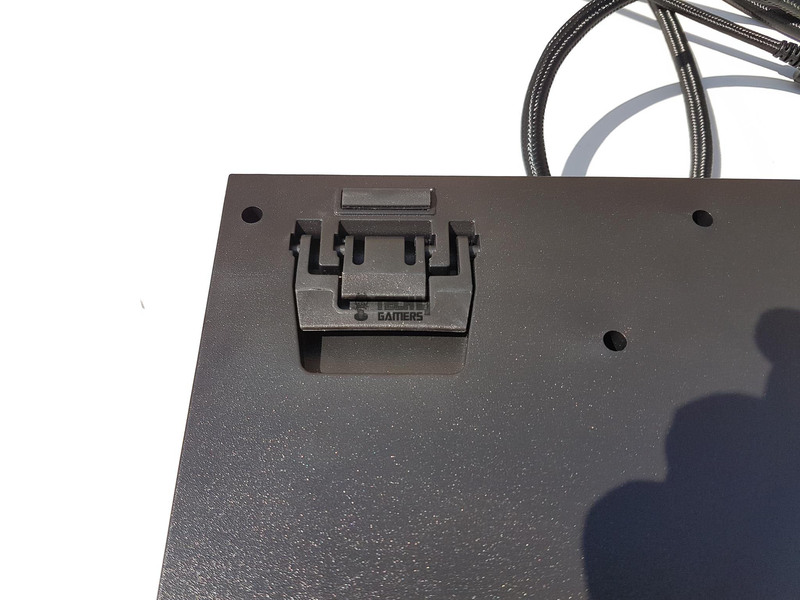 The part of the box on the top side of the keyboard has cables tucked inside. The TT Premium X1 RGB Cherry MX Blue Keyboard features an aluminum overlay design with Cherry MX Blue switches to ensure that users enjoy outstanding performance while gaming. The keys are suspended floating design which makes the RGB color illumination one heck of a show on this keyboard. The keyboard has a simple layout. It has a dimension of 464.98×170.52×40.39mm (LxWxH). It comes in the black color which is fingerprint magnet so keep that in mind. The Cherry MX Blue switches are rated for 50M clicks. 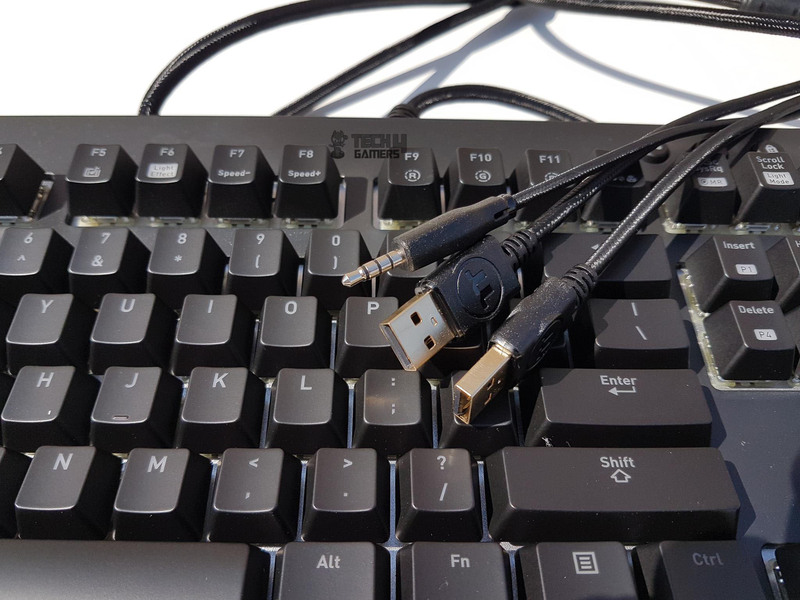 USB pass-through has been around for some time and this keyboard also features the USB pass through but Thermaltake has taken the concept to the next level by introducing the Audio Jack pass through as well which can ease the short cable issue of the headphones depending upon the situation. The keyboard has a double height adjustment mechanism as well as a detachable magnetic wrist pad. The overall finishing is industrial in terms of the look and feel. Using aluminum body ensures the maximum strength and ruggedness to the design element yet adding a subtle touch to it. This keyboard has 4 Mb onboard memory to store the user’s defined settings. Hence the users have a peace of mind should they take the keyboard along to the LAN gaming or such events. The polling rate is 1000Hz on it. Of course, the main selling point here is the 16.8M RGB color illumination on this keyboard which looks that good in person. The keyboard has a white color diffuser plate built on top of the PCB sandwiching the switches and the PCB. This is done for better color illumination across the entire length of the keyboard. Please, note that the diffuser is only visible where the keys are located as the rest of the area is covered with a top aluminum plate. The keyboard features N-Key roll over anti-ghosting and there are not macro keys on it. Our sample of the TT Premium X1 RGB Cherry MX Blue Keyboard is using UK layout. I am not sure what other layouts are available for this keyboard. Let’s start with the numpad. We have a full-size numpad on this keyboard with a US layout. Keycaps are slim and in ABS shot material. The Num Lock key has a lock symbol on it. A few keys have double markings on it which means the in addition to the regular function of the key, additional functions could be activated using the combination of the Shift key and the corresponding key on the num pad. This keyboard has dedicated multimedia keys. The row of buttons right on the top of the Num pad have Stop, Previous, Play/Pause, and Next track keys with corresponding actions. The top row has a volume rocker with some fine grip to it. It increases/decreases the volume by a count of 2. There is a Mute button on its right side with a toggle effect. Pressing it once will mute the sound and pressing it again will unmute the sound. The bottom part of the keyboard right before the Num Pad has standard 4 arrow keys for navigation. The above picture is clearly showing the white color diffuser plate right below the keycaps. There are three rows of the keys on the upper side of the navigation arrow keys. The top row has three buttons in it. We have a Print Screen key on the left side followed by the Scroll Lock key and Pause Break key. These keys have dual functionality as well. The second functionality on these keys can be activated using a combination of Fn key and any of these keys. We will show the functions in the table of functions below. Next is a group of 6 keys in two rows. We have Insert, Home, PgUp (Page Up) keys on the first row and Delete, End, PgDn (Page Down) keys in the second row. These keys also have double functions. 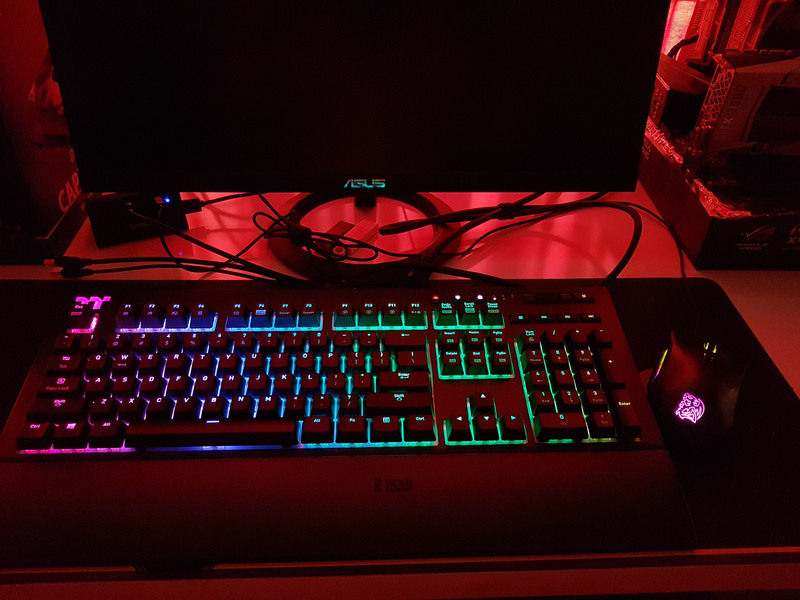 There are 6 predefined colored profiles on this keyboard each with a customized lighting effect which can be further tailored in the X1 RGB software. 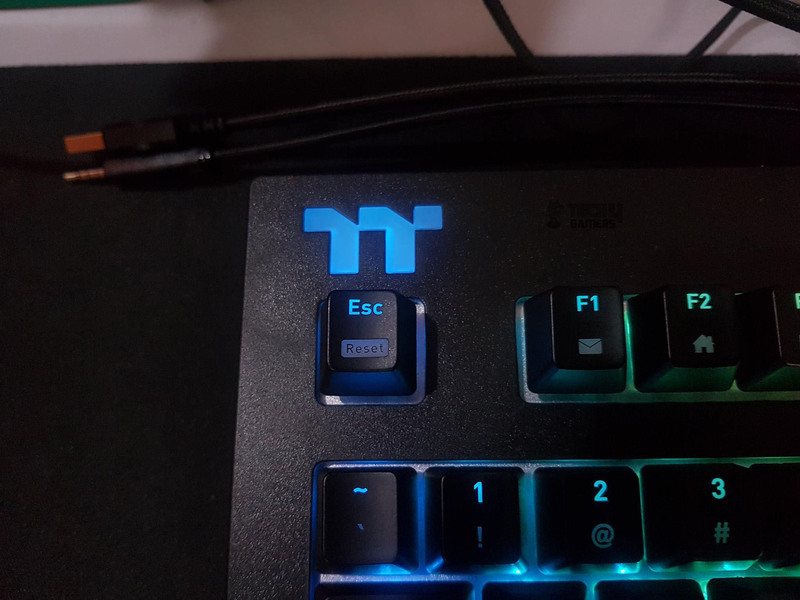 There is a cutout on the top leftmost side of the keyboard in the shape of the TT logo. The white color diffuser plate is also visible underneath it clearly indicating that this logo lights up as well. The logo is located above the Escape key. The Esc key also has dual functionality. It loads the factory settings of the keyboard for which the combination of Fn and Esc keys is to be used. The above picture is showing the lighting effect on the TT logo. This looks that dope in person. The attention to the details is immaculate. 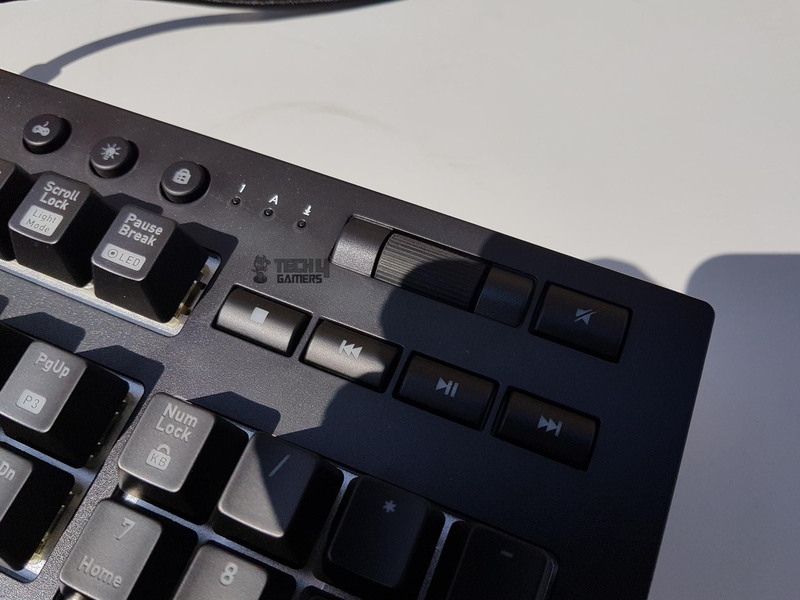 The topmost row of the keyboard is the standard function keys starting from the F1 key and going all the way up to the F12 key. All of these keys have dual functionality for which the combination of Fn key is needed with the function keys. The keys are organized in a group of 4 per row. The main section of the keyboard has a standard layout. We have Esc key in the top left most row followed by the function keys from F1 to F12 grouped in 4 keys per column as mentioned above. The backspace and the Enter keys are identical except that the Enter key has a bit more length to it. Some people prefer the larger size of the Enter key and they may not find this implementation convenient so choose keyboard layout type carefully before buying one. We have Windows key on the left side of the spacebar key whereas the Function key and Properties key are on the right side. The main section of the keyboard does not have any key that requires a combination with the Fn key. Let’s take a look at what key combinations have an effect on the keyboard form and function. Fn Esc Loads the factory settings. 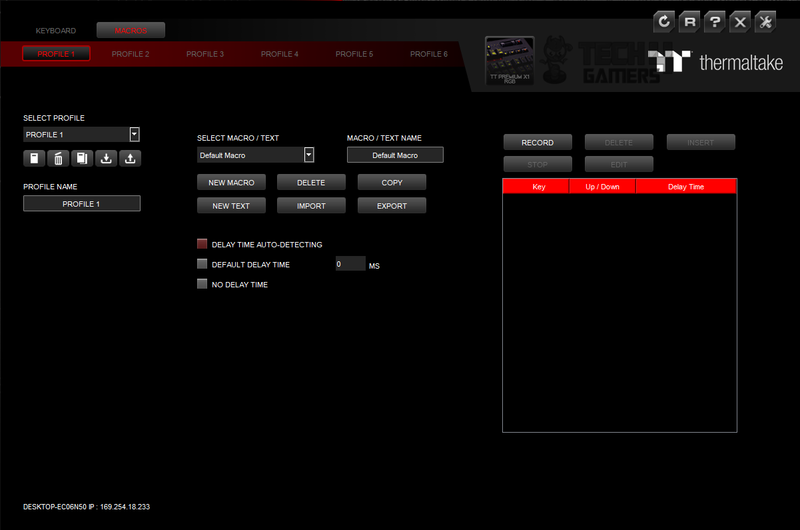 Fn Insert Loads Game Lighting Profile 1. Fn Home Loads Game Lighting Profile 2. Fn PgUp Loads Game Lighting Profile 3. Fn Delete Loads Game Lighting Profile 4. Fn End Loads Game Lighting Profile 5. Fn PgDn Loads Game Lighting Profile 6. Fn F1 Launches the default mailing software. Fn F2 Launches the default web browser. Fn F3 Launches My Computer. Fn F4 Launches the Calculator app. Fn F5 Launches the default music player. Fn F6 Changes the Light effects. Fn F7 Reduces the speed of the dynamic lighting effect. Fn F8 Increases the speed of the dynamic lighting effect. Fn F9 Red Color of the RGB Lighting. Fn F10 Green Color of the RGB Lighting. Fn F11 Blue Color of the RGB Lighting. 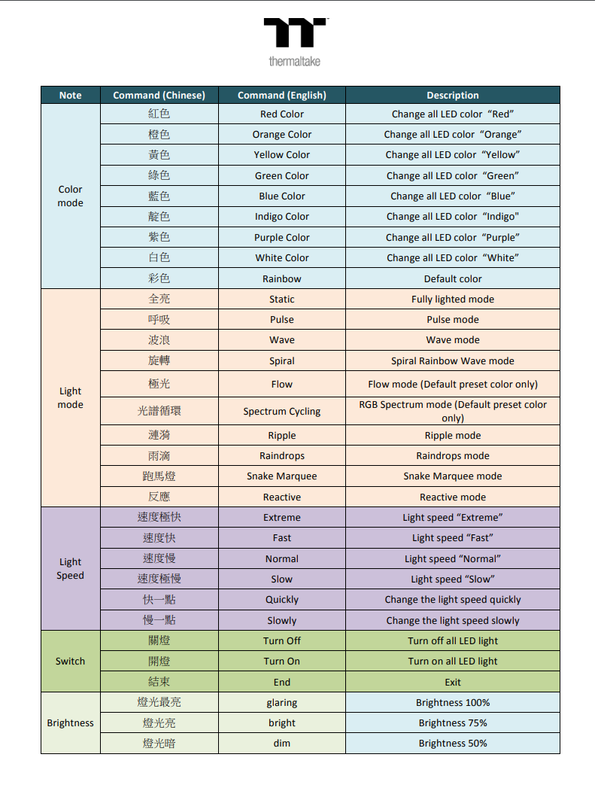 Fn F12 RGB Lighting Control. 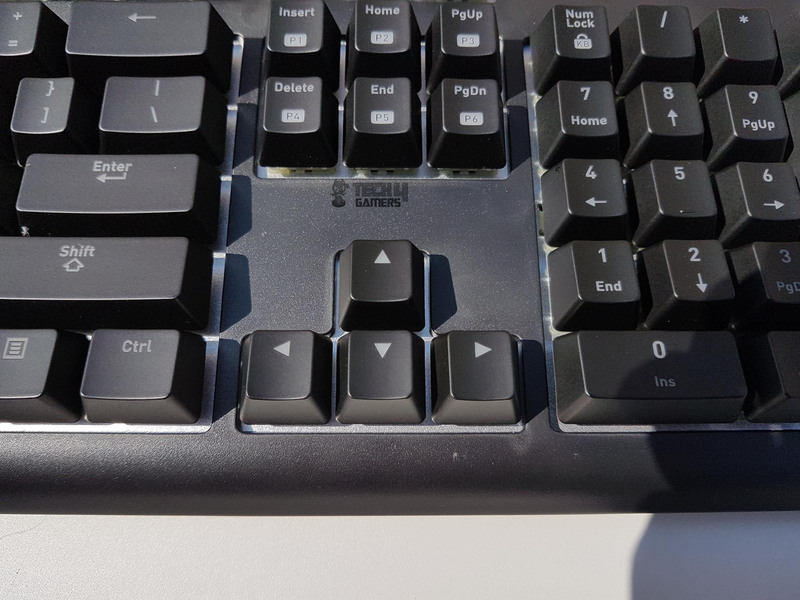 Fn Scroll Lock Default Zone Backlight Mode Keys. Fn Pause/Break Lighting Recording Key. Fn Num Lock Locks/Unlocks the full keyboard. Now, that we have discussed the keyboard layout, let’s take a look at its switches. TT Premium X1 RGB Cherry MX Blue Keyboard features the Cherry MX RGB Blue Switches. These switches have 2.2 ± 0.6mm actuation point, 4 – 0.5mmkey stroke, with 50g actuation force with tactile feedback and clicky sound. The keyboard features an aluminum plate on the top. The frame of the keyboard is made of an aluminum material though it seems to be sandblasted finishing, not a brushed aluminum. There is a translucent white color diffuser resting between the aluminum top plate and the actual PCB. The switches are suspended in that diffuser. This reminds me of the K70 strafe keyboard from the Corsair. 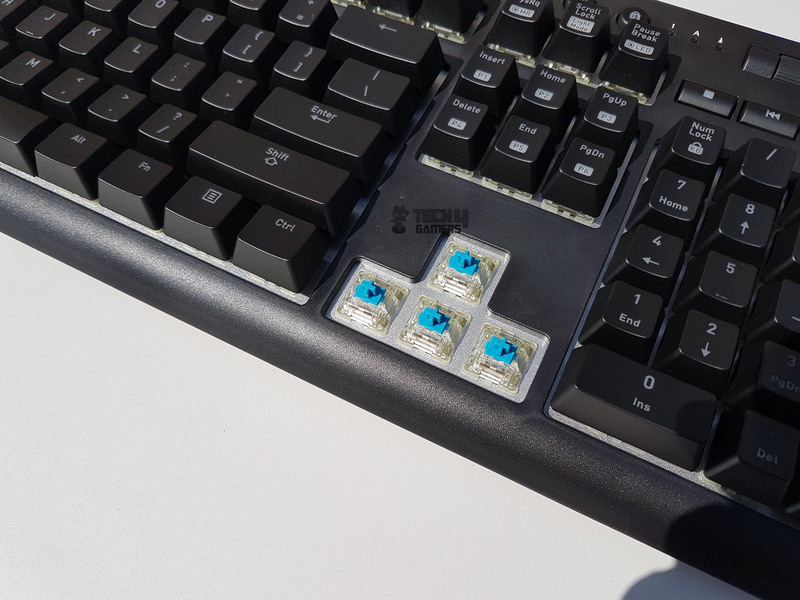 The keys are suspended in floating design and there is more height between the keycaps and the aluminum plate which makes the lighting effect giving intense visuals still without uneven diffusion of the light. Tt eSPORTS have definitely delivered quite a solid design here. The top aluminum plate on the TT Premium X1 RGB Cherry MX Blue Keyboard extends over the sides and has rounded finish which syncs in well in the overall design symmetry. 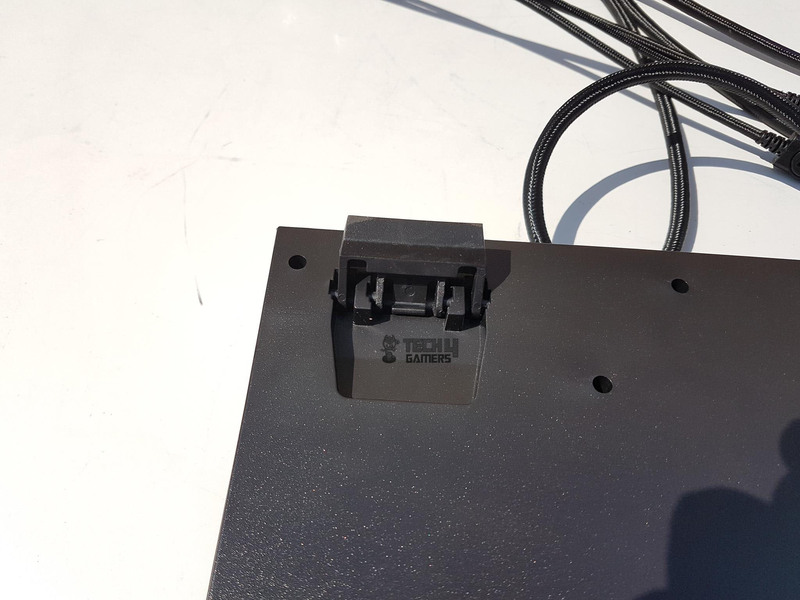 Looking at the front side of the TT Premium X1 RGB Cherry MX Blue Keyboard, we have a USB pass-through port followed by the audio jack pass-through port. Both were found working flawlessly. The port and cable side is protruding from the rest of the surface. 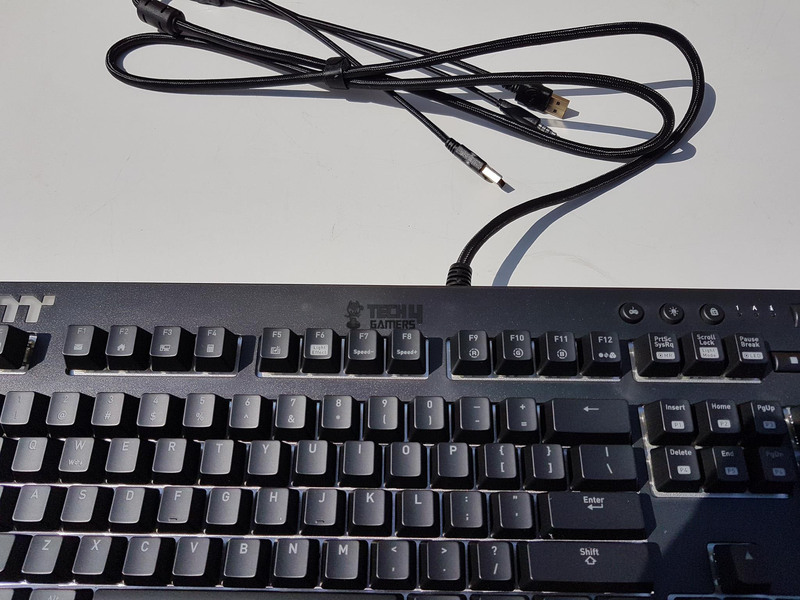 TT Premium X1 RGB Cherry MX Blue Keyboard has a thick braided cable measuring 1.8m in length. It has three cables at the terminating end. All have gold plated contact points. One is the main keyboard cable, other is for the USB pass-through functionality and the third one is the audio jack pass-through cable. The connectors have a TT premium logo on one end. TT Premium X1 RGB Cherry MX Blue Keyboard has a detachable magnetic wrist pad. It has a solid structure and taking it off and on is quite easy. It has 5 rubber paddings on the backside to avoid scratching on the surface where the keyboard will be placed. Let’s take a look at the backside of the TT Premium X1 RGB Cherry MX Blue Keyboard. There is a sticker pasted on the middle. It has the model of the keyboard and TT Thermaltake printed on it. The keyboard takes 5V DC and 1A maximum. The bottom side has three rubber paddings to avoid scratching on the surface. Similarly, the top side has two such paddings. The bottom has two cutouts. This is where the wrist rest slides into. There are two surface raisers on the top side to raise the front part of the TT Premium X1 RGB Cherry MX Blue Keyboard for convenient typing and gaming for an extended period of time. 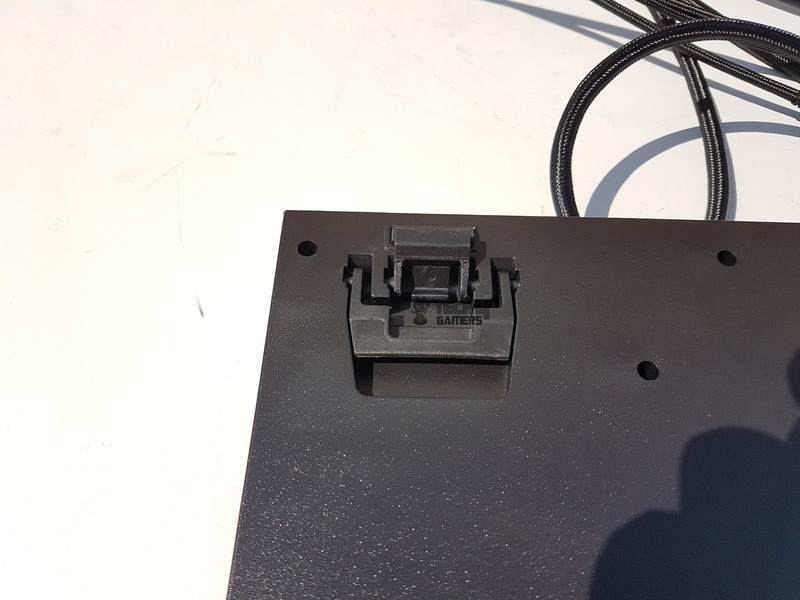 Thermaltake has a smart implementation here as the surface raisers have two stepped design which allows the users to raise the height of the keyboard in two steps as shown in the pictures above. 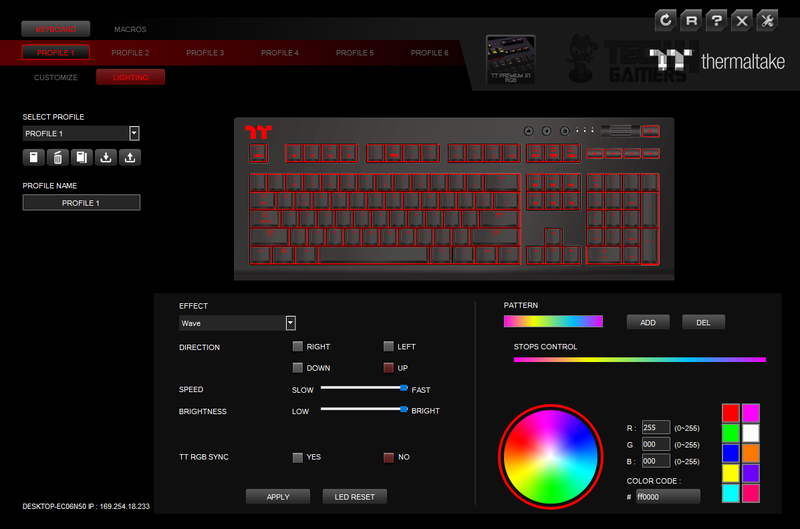 TT Premium X1 RGB Cherry MX Blue Keyboard is using N-Key roll over with polling rate of 1000 Hz. 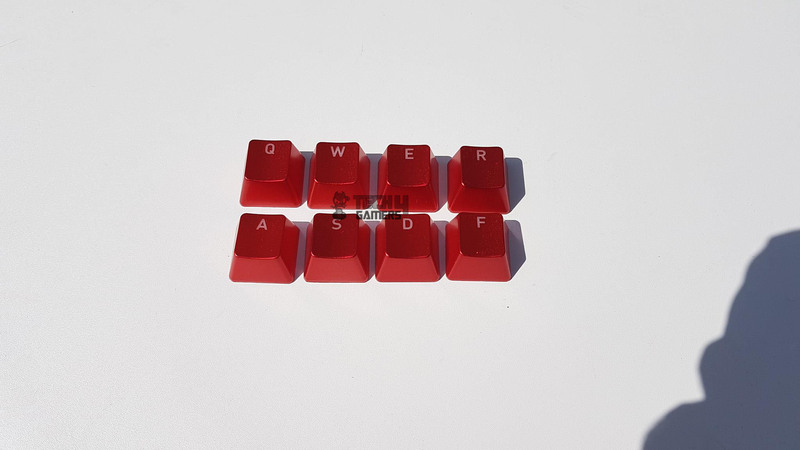 The Thermaltake has bundled 8 red colored keycaps with TT Premium X1 RGB Cherry MX Blue Keyboard to customize the keyboard should the user wants. Now that we have discussed the key elements of the TT Premium X1 RGB Cherry MX Blue Keyboard, it is time to take a look at the stellar feature of this keyboard which is per key backlighting of up to 16.8 Million RGB colors and with predefined 10 color effects. To control the lighting effect on this keyboard the user has two options. 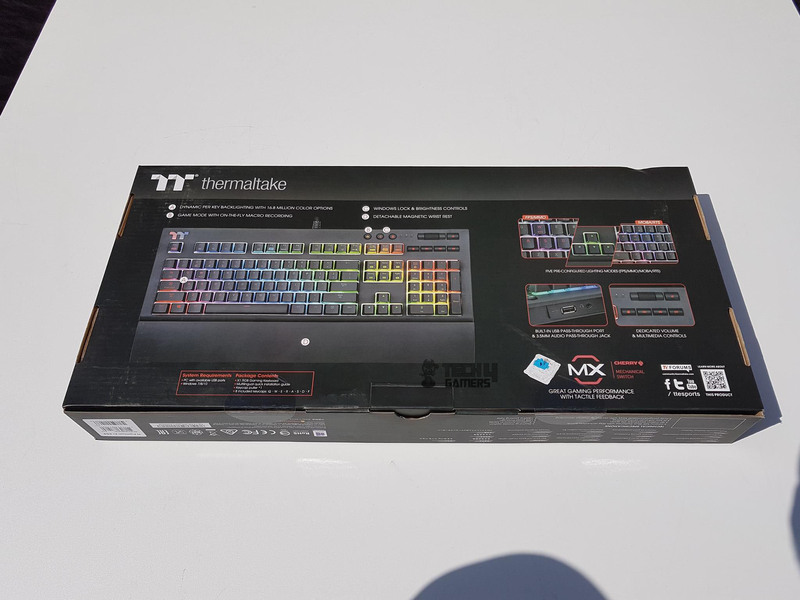 Either use the combination of the Fn and F9-F12, Scroll Lock, Pause, Ins, Home, PgUp, Del, End, PgDn keys combination or use the simple and easy to use software/mobile app called X1 RGB that Thermaltake has provided. The user has the option to turn off the LED lights all together though I don’t see why would deprive himself or herself of such stunning lighting implementation. This is not it. Each of these presets has its lighting colors and lighting effects. Here are a few pictures for your eye pleasure. Take control of your colors and sync seamlessly with all Thermaltake TT X1 RGB Sync compatible Power Supply and Liquid Cooling Solutions – iRGB PSU, Riing Plus, Pacific W4 Plus CPU Water Block, Pacific RL360 Plus RGB Radiator, Floe Riing RGB 360, Pacific Lumi Plus LED Strip – for maximum color coordination and personalization. For this ecosystem to work, Thermaltake has provided user intuitive software called X1 RGB. Not only its desktop version is available but mobile version as well which is compatible with iOS and Android. The mobile app can be downloaded from the respective stores. Please note that TT X1 RGB Sync compatible product lines will automatically sync with the X1 RGB gaming software and does not require manual setup. 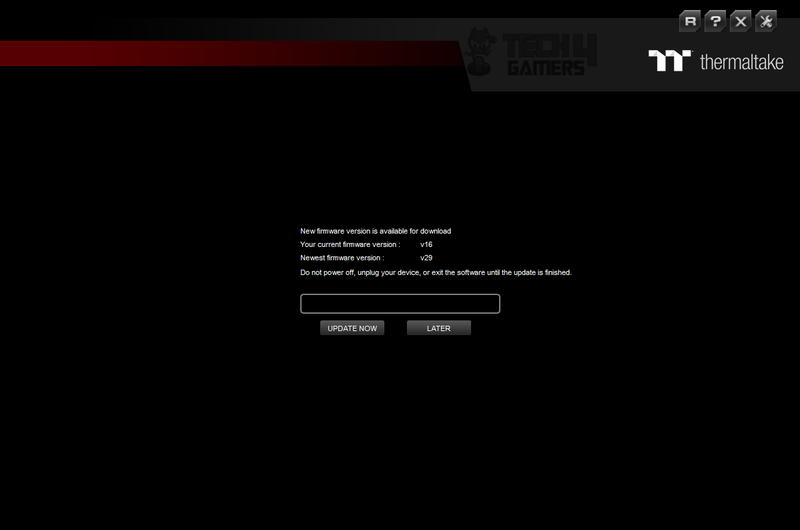 Let’s take a look at the desktop version of the software. The X1 RGB can be downloaded from the Thermaltake website. At first start, the software will detect the connected compatible Thermaltake devices and check for their firmware version. I have a complaint right from the beginning. The keyboard had an older firmware version and software only giving me two options which were either to update the firmware or exit the application as clicking on Later was not taking me anywhere. Why? It was a forced update that I had to take. Once the firmware was updated; I was presented with the plethora of customization and control options for the keyboard. The interface is nothing new. 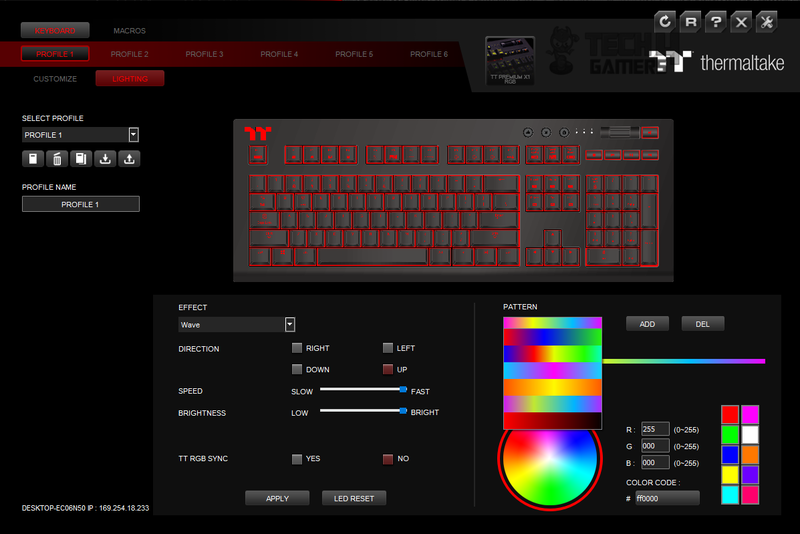 The Thermaltake premium logo and brand name are printed on the top right side below the set of action buttons. The first button on the top right side is the keyboard reset button that would load the factory settings. The R button will take you to their customer service portal website. The ? button will take you to the help center on their website. The X button will close the application. The control button will load the application settings window as shown in the below picture. The model of the keyboard is mentioned between the left and right side buttons on the top. The left side has two main options up top; Keyboard and Macros. By default, the Keyboard option is selected. As I have mentioned above that this keyboard comes with the 6 user profiles, these are are listed under Keyboard option sequentially. Under each profile we have two options; Customize and Lighting. By default Customize option is selected and further options are available at the user’s disposal. The user can rename the Profile name, export/import profile settings and most of all can define the individual key’s action. 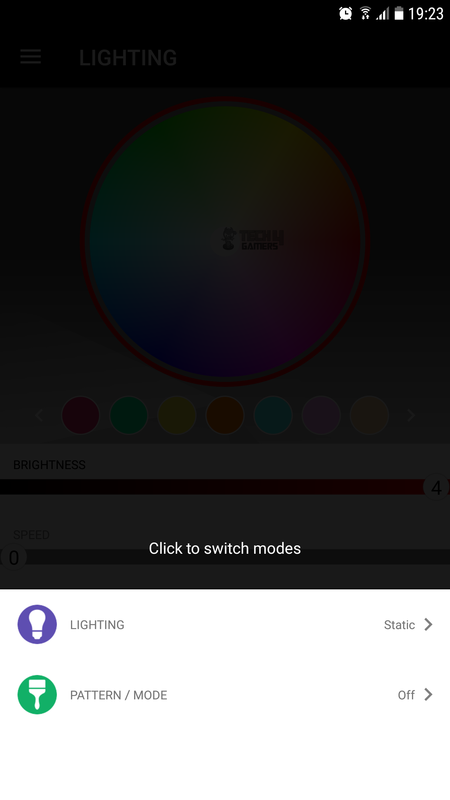 Clicking on Lighting will load the lighting related settings which are extensive. On the top, there is a keyboard picture that will dynamically show the currently applied lighting effect. 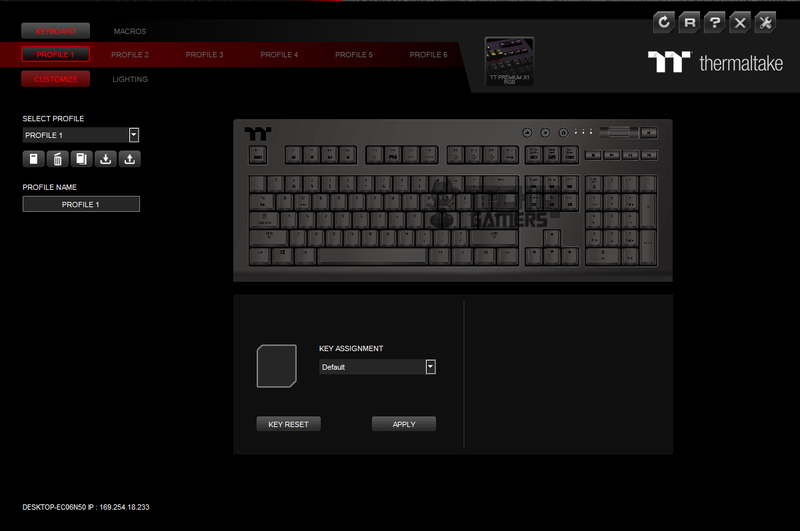 Clicking on Effect drop down box will show all the supported lighting effects on this keyboard. The above pictures show all the listed and supported lighting effects on this keyboard. We have already listed them in the RGB Lighting section. If you are wondering where the true Rainbow mode for this keyboard is, there is a bit of lacking on this aspect. There are pre-defined Patterns that you can access as shown in the above picture. Select Wave lighting effect from the Effect drop-down list and then use the Pattern drop-down list to select the pattern of your choice. A good thing is you can define your own pattern as well as delete the selected one. You can set the direction of lighting flow in any of the four directions (Up, Down, Left, Right). You can control the speed of the lighting flow which is only applicable to the dynamic effects. 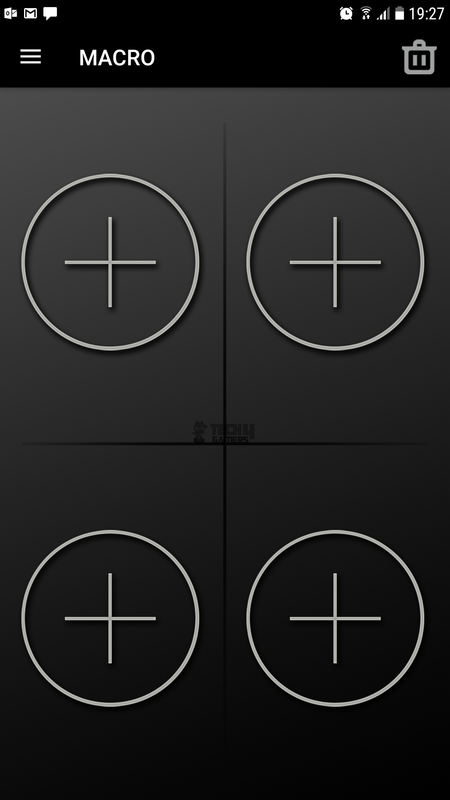 You can control the brightness of the light as well in 5 discrete steps. You can enable/disable the TT RGB Sync option in case of using more than one TT RGB supported device. The colors can be defined using the RGB values or hex code or from the color palette. Clicking on Macros up top will load a new interface with plenty of options for the users to create, modify, and delete the macros. Now that we have taken a look at the desktop application, it is time to take a look at the mobile version of the app with more options like Voice Control etc. In order for your mobile device to detect the TT RGB compatible device, both devices need to be on the same network otherwise, the mobile app would not be able to detect the device. 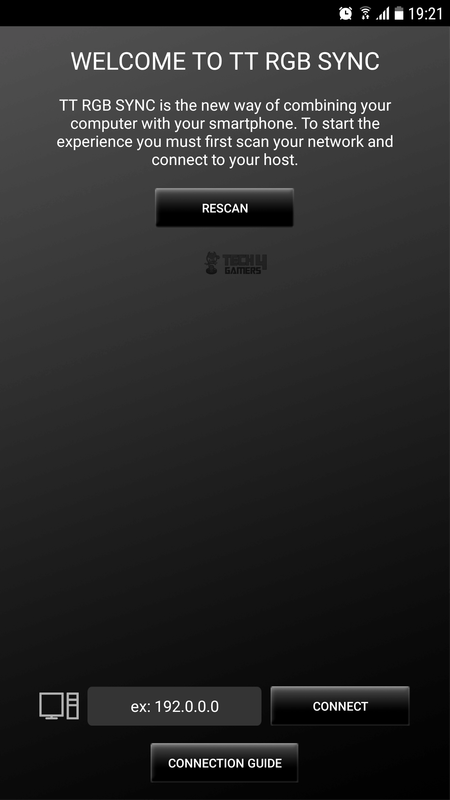 Click on the Rescan button in case the app fails to detect the connected device as the app is programmed to scan the network for the compatible devices on launch. A successful scan will list the PC having a compatible device. Tap on the device to proceed. 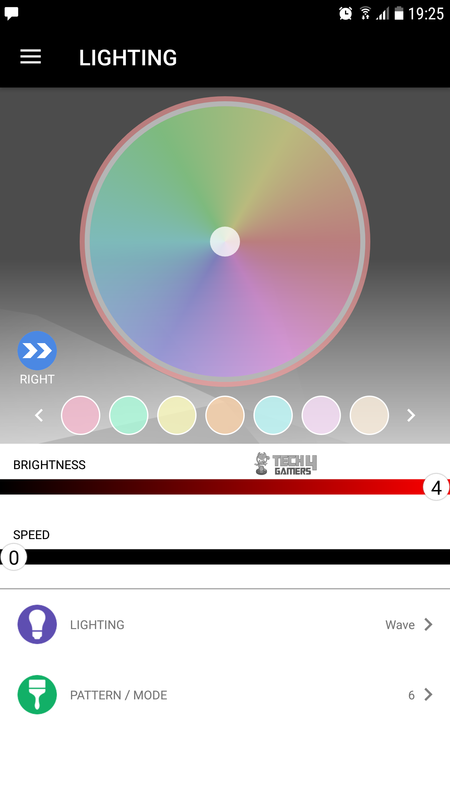 By default, the app will take you to the lighting area and you will be asked to select the Lighting effect and the pattern. The Patterns in the lighting format are not available in the app but only in the number format starting from 1 going to the number 6. This is definitely not a handy implementation as a visual aid on which format is to be selected is missing. 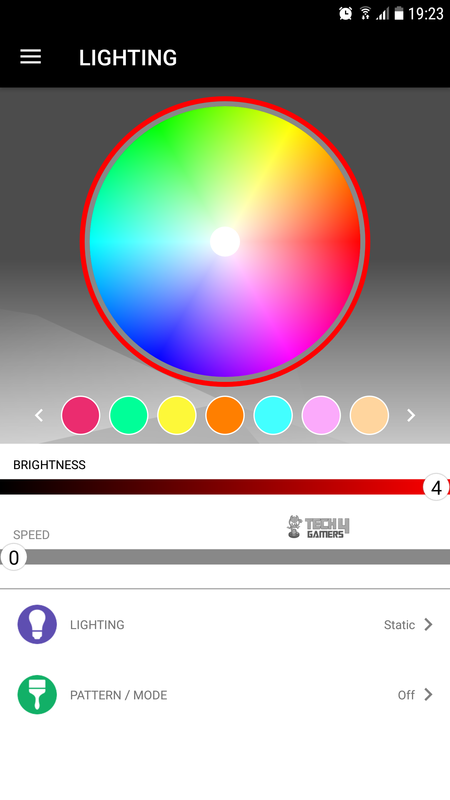 The above picture shows the lighting control function of the mobile app. The user can almost use any feature that the desktop application provides. The virtual keyboard will let the user interact with the PC using the remote keyboard feature. 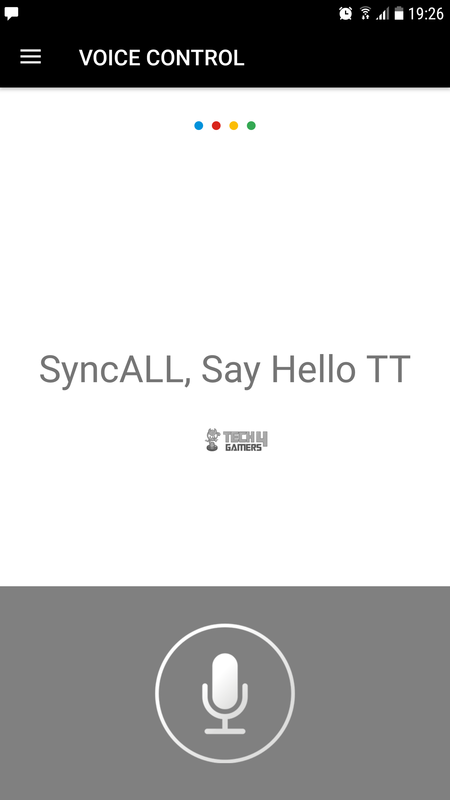 SyncAll, Say Hello TT is the slogan of the Thermaltake when it comes to their premium TT devices and their feature. The user can control the keyboard lighting features using the voice commands. 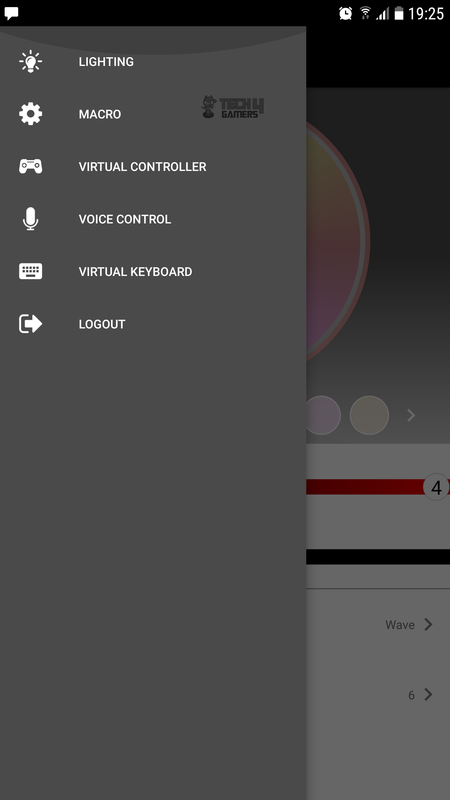 The above picture lists the available voice commands that the user can use to control the lighting effects of the keyboard using the Voice control feature of the mobile app. 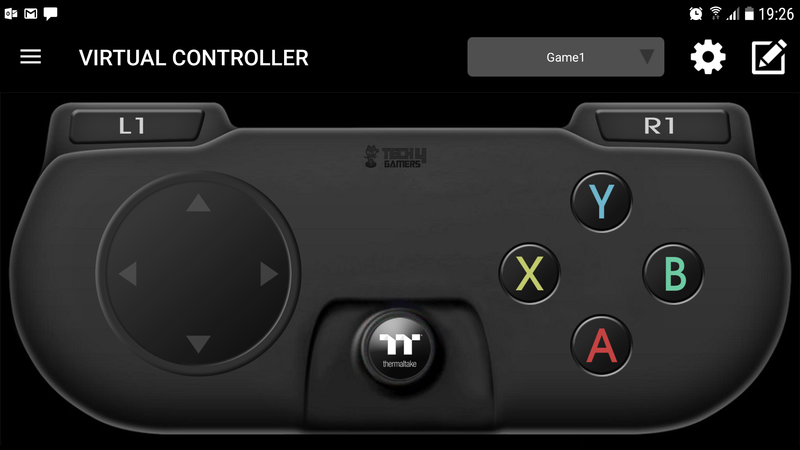 Do you want to play a game using the controller without actually having a physical controller? Worry not as the Thermaltake X1 RGB mobile app will let you do exactly that. Sounds like fun! It indeed is. Give it a try for some gaming fun. Click on any + symbol to create user-defined macros using the mobile app. 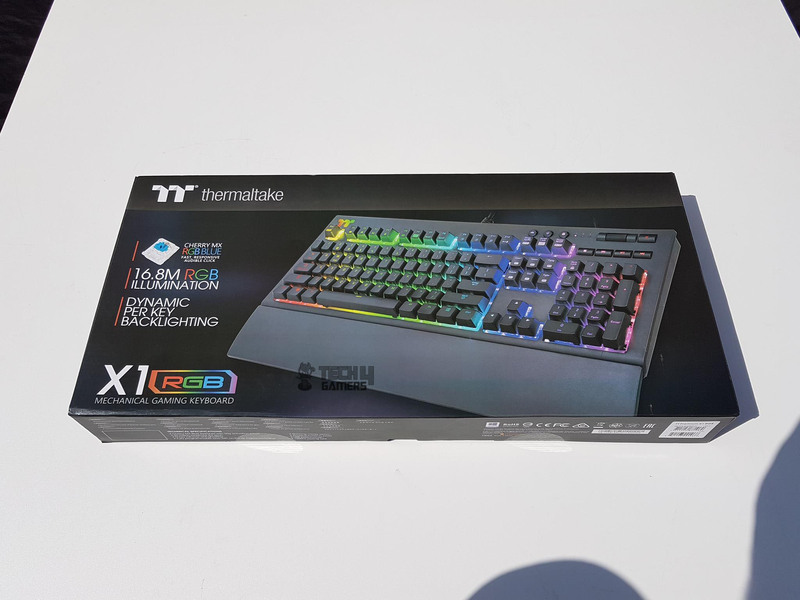 The TT Premium X1 RGB Cherry MX Blue Keyboard has been the Thermaltake’s premium keyboard until now as they have launched the Level 20 series of the premium keyboards and has taken a game to a new level. 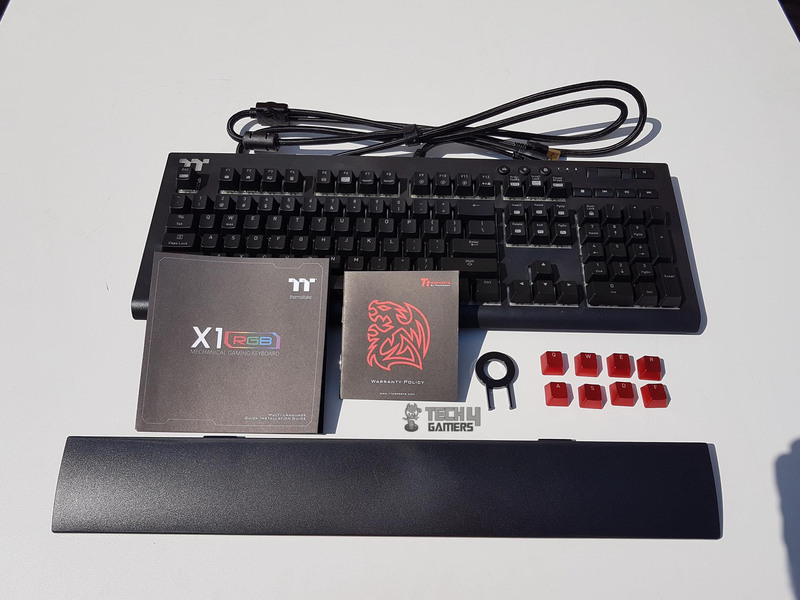 The TT Premium X1 RGB Cherry MX Blue Keyboard was their new addition in the TT Ecosystem of RGB/ARGB devices that can be synced and color coordinated. The TT Premium X1 RGB Cherry MX Blue Keyboard features an aluminum overlay design with Cherry MX Blue switches to ensure that users enjoy outstanding performance while gaming. The keys are suspended floating design which makes the RGB color illumination one heck of a show on this keyboard. It has a dimension of 464.98×170.52×40.39mm (LxWxH). It comes in the black color which is a fingerprint magnet. The Cherry MX Blue switches are rated for 50M clicks. 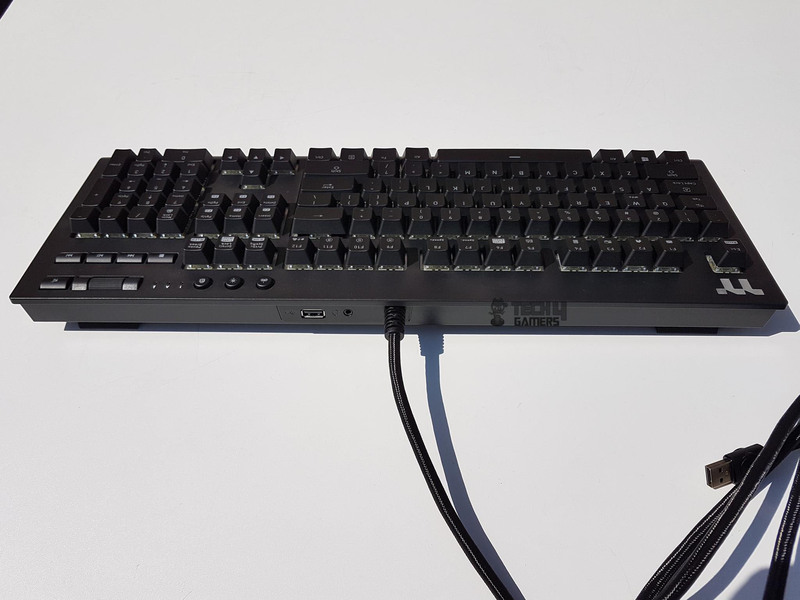 The TT Premium X1 RGB Cherry MX Blue Keyboard features USB pass-through port and audio jack pass-through port which is something new for the keyboard. This keyboard has 4 Mb onboard memory to store the user’s defined settings. Hence the users have a peace of mind should they take the keyboard along to the LAN gaming or such events. The polling rate is 1000Hz on it. Of course, the main selling point here is the 16.8M RGB color illumination on this keyboard which looks that good in person. The keyboard has a white color diffuser plate built on top of the PCB sandwiching the switches and the PCB. This is done for better color illumination across the entire length of the keyboard. Please, note that the diffuser is only visible where the keys are located as the rest of the area is covered with a top aluminum plate. The keyboard features N-Key roll over anti-ghosting and there are not macro keys on it. Our sample of the TT Premium X1 RGB Cherry MX Blue Keyboard is using UK layout. I am not sure what other layouts are available for this keyboard. 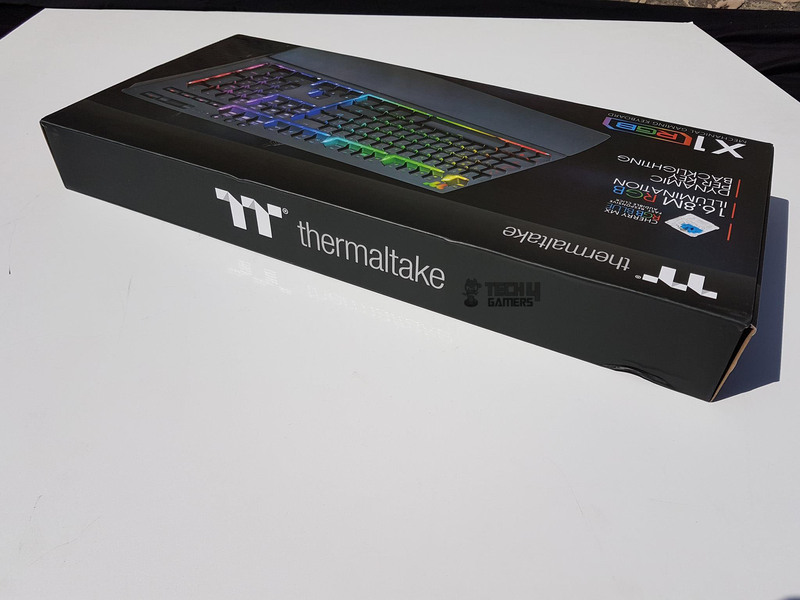 The Thermaltake has no compromise on the quality of the switches as they have employed the industry’s top-notch switch manufacturer Cherry MX and this model is using the Cherry MX RGB blue switches which are rated for 50 M clicks with 2.2 ± 0.6mm actuation point, 4 – 0.5mmkey stroke, 50g actuation force with tactile feedback and clicky sound. I love the audible sound on these switches though I am not sure about the other people around me when I am using these! XD The keys are in floating design and there is a white color translucent diffuser underneath covering the entire PCB to reflect some stunning RGB lighting effect which definitely looks that dope in person. 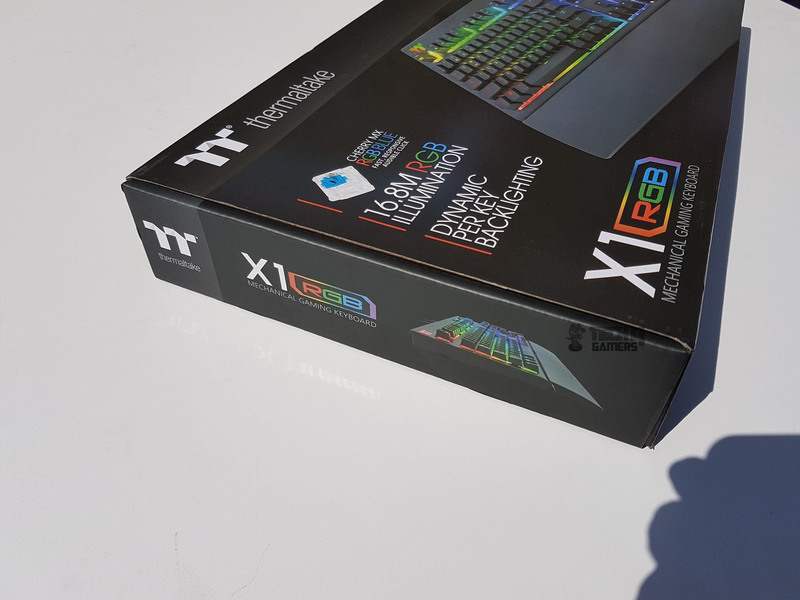 The TT Premium X1 RGB Cherry MX Blue Keyboard is using 16.8M RGB backlighting per key which can be controlled using the X1 RGB software. 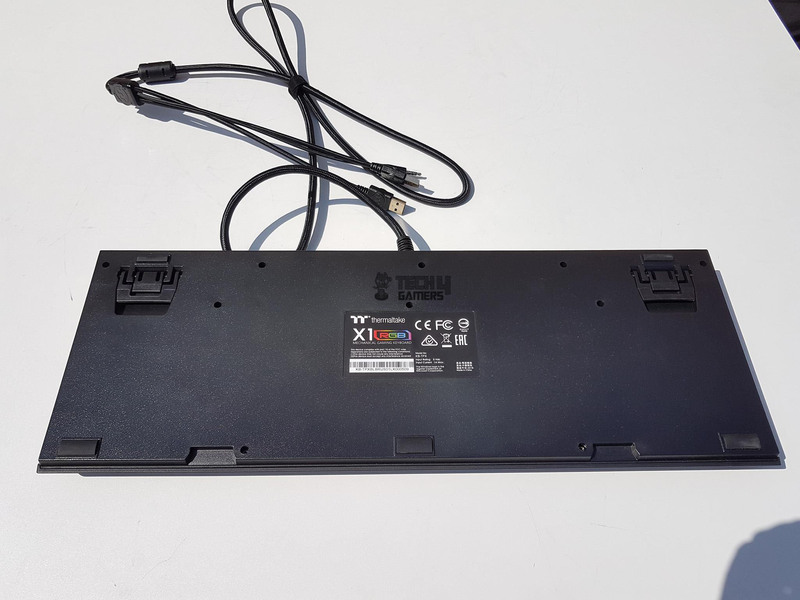 The TT Premium X1 RGB Cherry MX Blue Keyboard has 1.8m of the well sleeved and relatively a thicker cable which is understandable as this keyboard has Audio Jack pass through cable as well. The backside has two height increasing stands with the possibility of adjusting the height in two discrete steps. There is enough rubber padding on the back side to avoid the scratches on the surface where the keyboard will be put on. The keyboard has a detachable magnetic wrist pad which is a solid build and adds more ruggedness to the keyboard. 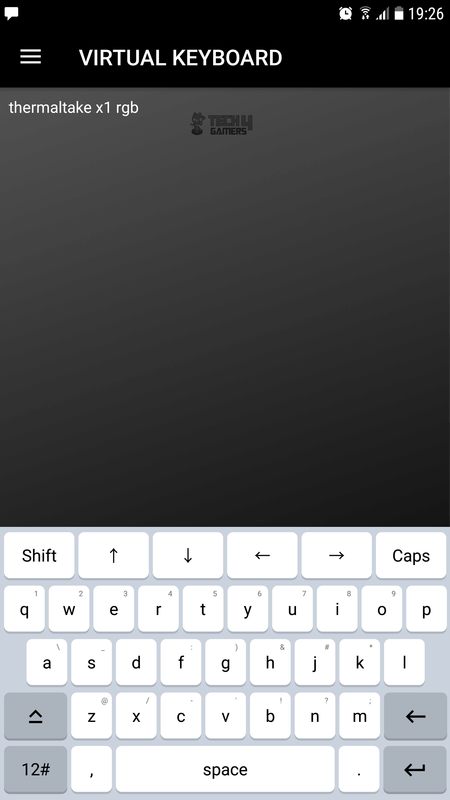 The complete keyboard can be locked using the Fn and Num keys combination. The TT Premium X1 RGB Cherry MX Blue Keyboard has dedicated multimedia control keys along with the volume rocker. Somehow, this design reminds me of Corsair’s keyboard designs. 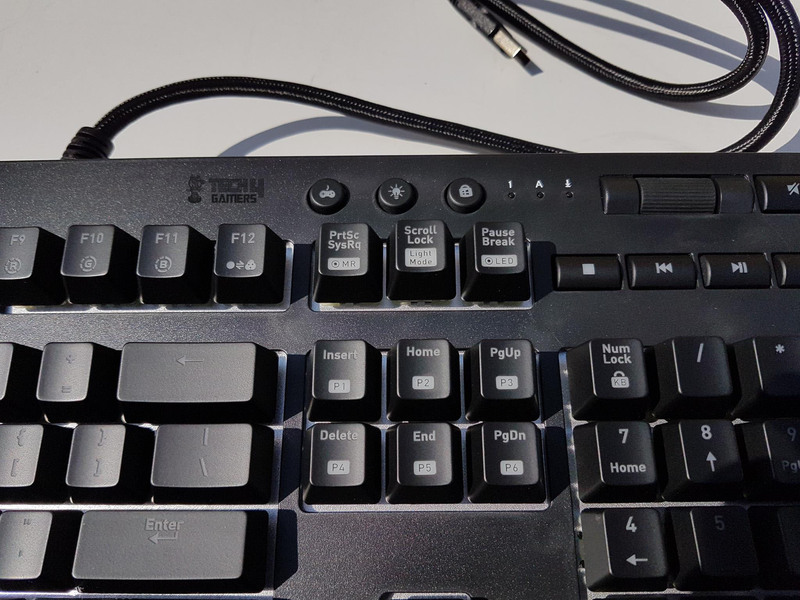 The keyboard has a Fn (function) key and there are many keys on this keyboard with dual functionality and that can be activated using the combination of the Fn and that key. 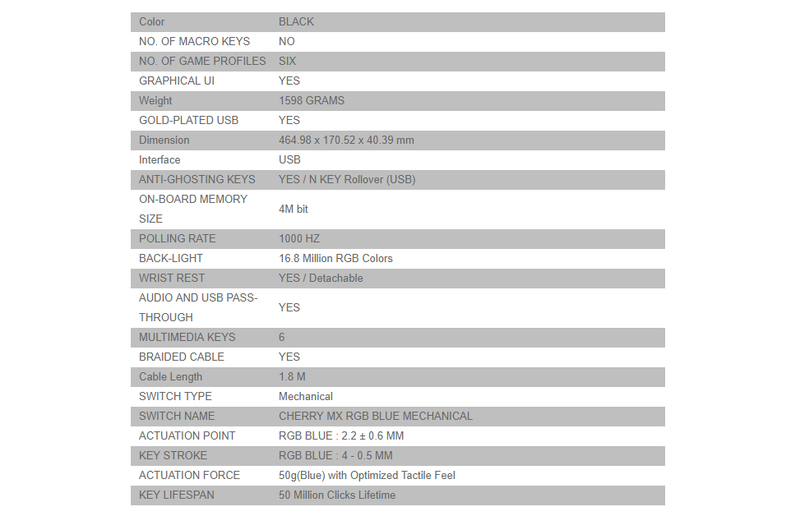 Please refer to the table of such keys above for more details. One thing that I would like to mention is the lack of proper details in the user manual. 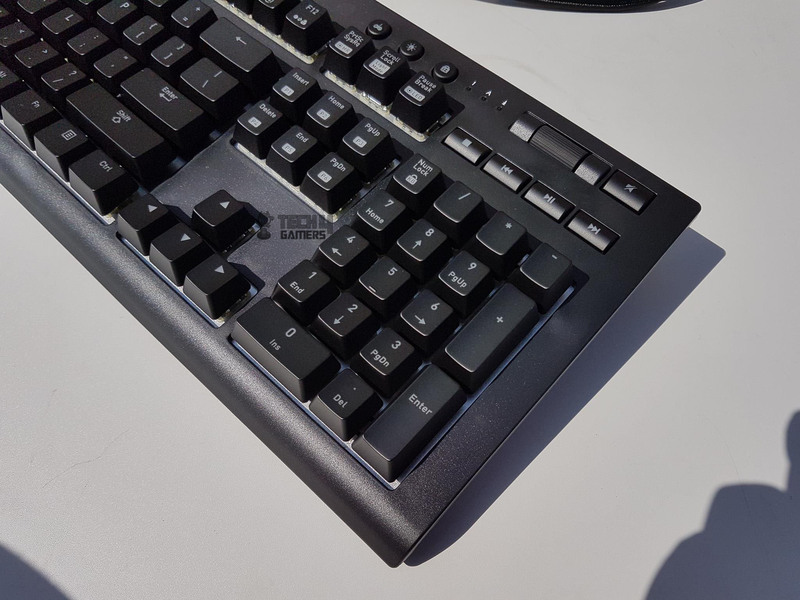 The TT Premium X1 RGB Cherry MX Blue Keyboard’s lighting can also be controlled using the combination of the Fn and F9-F12, Scroll Lock, Pause/Break. The keyboard has predefined 12 dynamic and static modes as well as pre-defined patterns for dynamic lighting effect. The keyboard has 6 pre-defined user profiles which can be accessed using the combination of Fn and any of the Insert, Home, PgUp, Delete, End, PgDn keys combination. 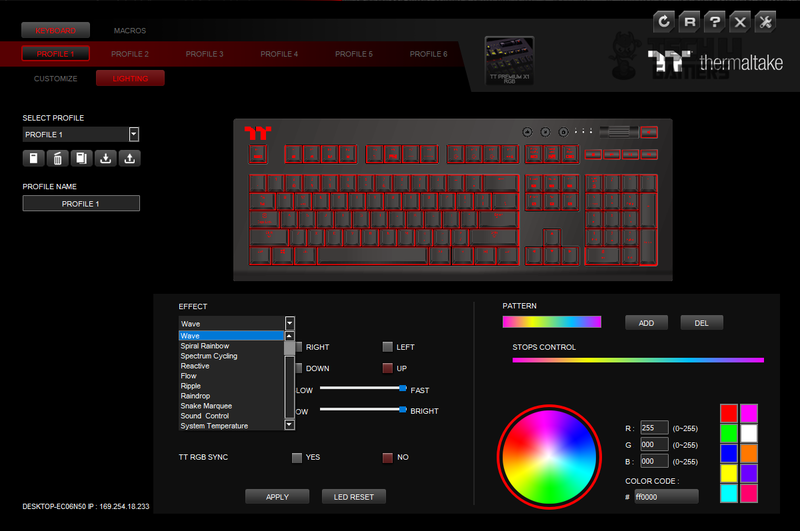 They can be further customized using the X1 RGB software. Not only that but Tt eSPORTS has provided 5 pre-defined lighting effect presets for the gaming type covering the maximum gaming enthusiasts out there. 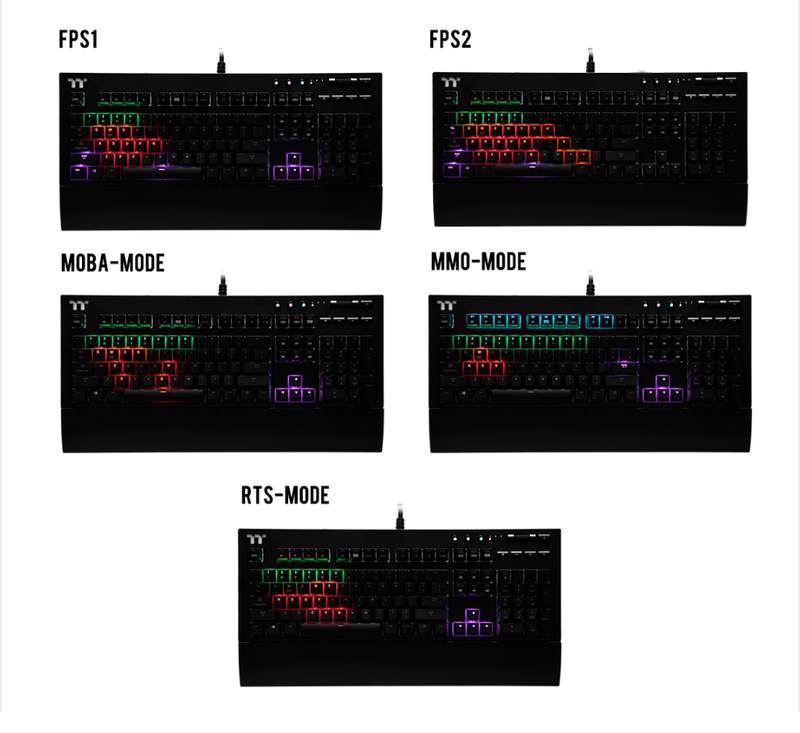 FPS1, FPS2, MMO, MOBA, and RTS have their dedicated color patterns that can be activated either using the keys combination. Not to mention that this keyboard also has Macro functionality provided by the software. I have had a few issues at the start. The PrtSc, Scroll Lock, and the Pause keys were wobbling. Removing and putting the keycaps back on saw this issue gone once and for all. The arrow keys were hard to press on. It was like these keys were a bit jammed. Putting them to a daily use saw this observation gone as well. Other than that, I have had an absolutely fantastic gaming and regular desktop experience with this keyboard and it has become my daily driver. The price of the keyboard is Rs. 16500 at the time of the review. 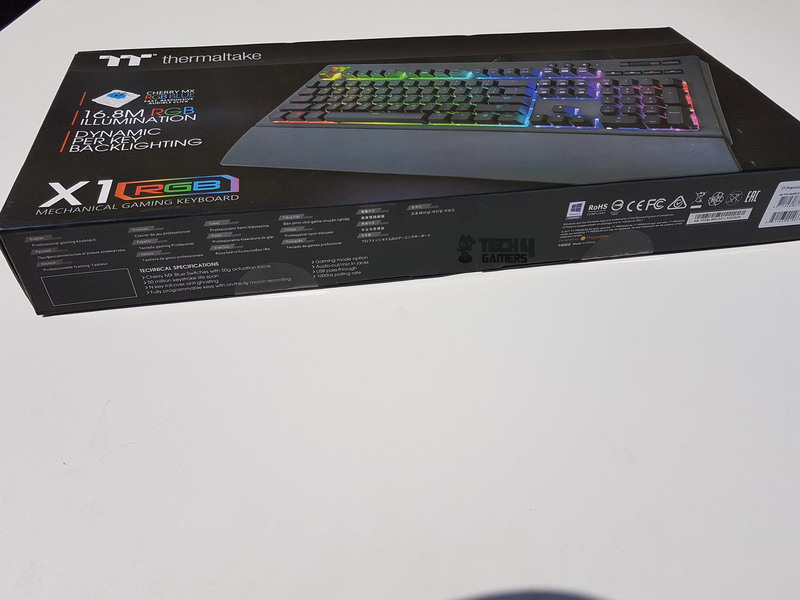 This price is highly competitive with the plethora of the features and the functions that the TT Premium X1 RGB Cherry MX Blue Keyboard comes with like dedicated multimedia keys, volume rocker, double height adjustment, all aluminum-based frame and top plate, stunning 16.8M true RGB backlighting, powerful software control, USB and Audio pass through, a magnetic wrist rest to name a few. The TT Premium X1 RGB Cherry MX Blue Keyboard is available at Shing with a 1-year warranty. 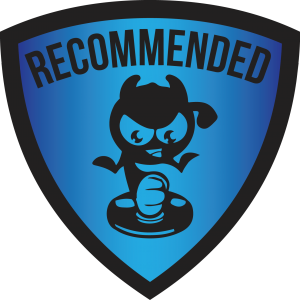 We are thankful to the Thermaltake for giving us the opportunity to review their TT Premium X1 RGB Cherry MX Blue Gaming Mechanical Keyboard. The TT Premium X1 RGB Cherry MX Blue Keyboard has almost everything the user can expect from the premium mechanical gaming keyboard. The switch choice is of the user and I really would not be commenting on that aspect but from a quality perspective, these keyboards are using Cherry MX switches. The X1 RGB uses CHERRY MX switches with built-in gold-crosspoint contacts, gold-plated contact closures, and pressure-resistant metal alloy springs for the most precise, accurate and feel for every touch. What else you could have asked for! With stunning 16.8M RGB backlighting and 12 vivid lighting effects and customizable patterns, this keyboard comes recommended by us.